Vietnam's vibrant Ho Chi Minh City (HCMC), still often called Saigon, is an electric destination, a thriving metropolis bursting with energy. Retreat to the serenity of a Saigon luxury hotel in a quiet enclave just steps from the buzzing city centre. 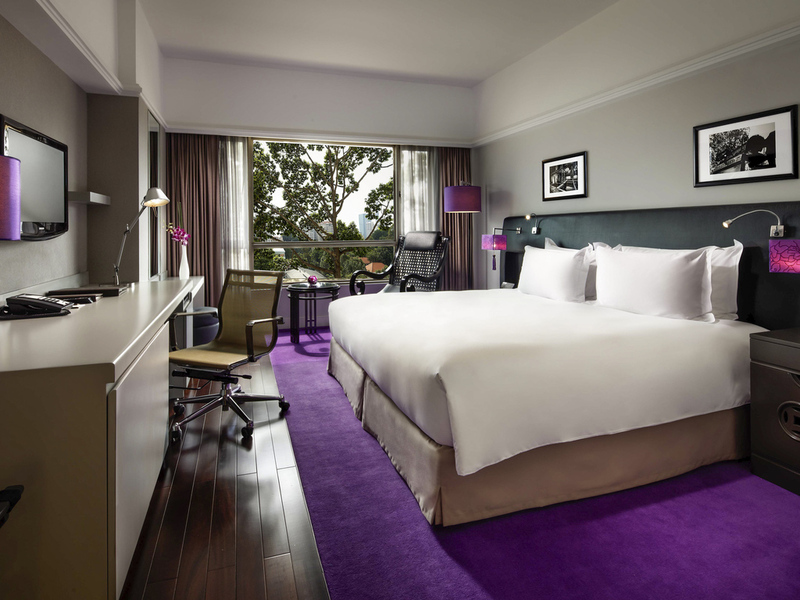 Sofitel Saigon Plaza is located on peaceful tree-lined Le Duan Boulevard just a moment from the citys commercial centre with its fabulous shopping dining and landmark attractions like Notre Dame Cathedral and Reunification Palace. 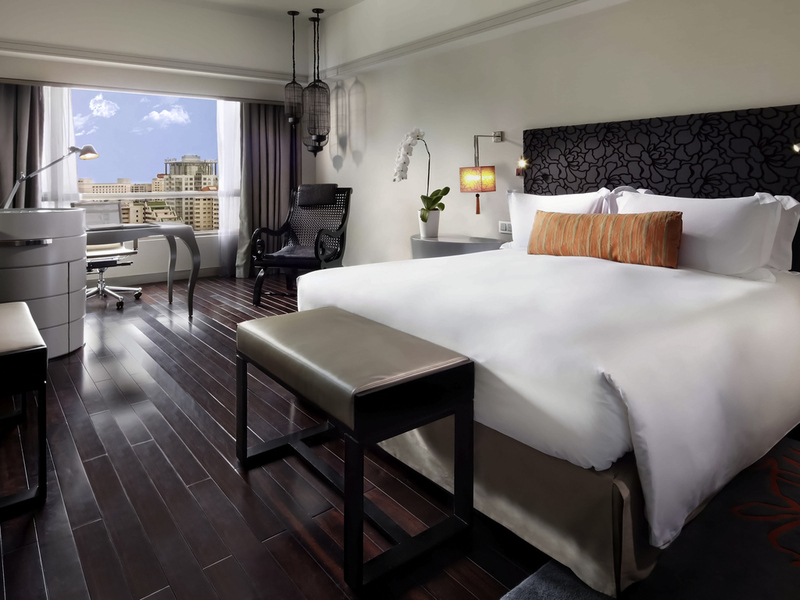 Our modern rooms offer stunning views of the city. Facilities include free Internet access, IDD telephone, safe box, minibar, free coffee/tea making facilities, prime international TV channels and a hairdryer in the bathroom. Luxuriate in immaculate 5-star accommodation by French designer Pierre Maciag. French and Vietnamese touches merge with sensory indulgences. The Imperial Suite is the largest suite in Saigon a luxe retreat for the most discerning travellers. 30 SQM / 325 SQFT, Located on floors 4 to 12, Panoramic windows, Sofitel MyBed and Pillow Menu, Lanvin bathroom amenities, Flat screen TV, DVD player, Complimentary Wi-Fi, Rollaway bed available upon request. 30 SQM / 325 SQFT, Located on floors 4 to 12, Panoramic windows, Sofitel MyBed and Pillow menu, Lanvin bath amenities, Flat-screen TV, DVD player, Complimentary Wi-Fi, Rollaway bed available upon request. 30 SQM / 325 SQFT, Located on floors 14 to 15, Panoramic windows, Sofitel MyBed and Pillow menu, Lanvin bath amenities, Flat-screen TV, DVD player, , Complimentary Wi-Fi, Rollaway bed available upon request. Spacious comfortable 30 m² (325 sq.ft.) 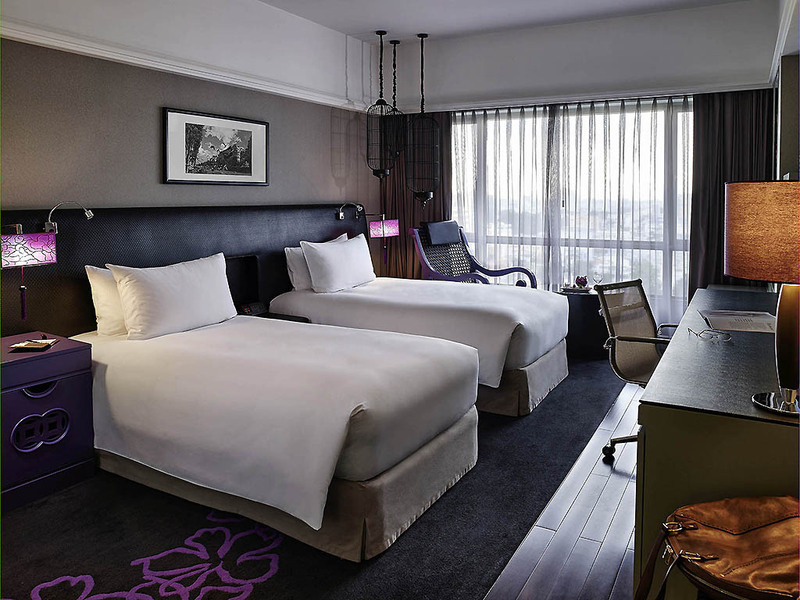 room with panoramic windows, Sofitel My Bed and pillow menu, flat-screen TV, DVD player, Lanvin bathroom amenities, complimentary Internet and access to Club Sofitel Lounge, located on floors 16 to 17. Guests staying in the executive floor club rooms and luxurious suites enjoy the Sofitels finest accommodation exquisite service exclusive benefits and access to the club lounge located on the 18th floor with a terrace providing panoramic city views. The Club Sofitel lounge welcomes guests for private check-in and check-out complimentary early arrivals and late departures club breakfast an open bar throughout the day evening cocktails free internet and unlimited local calls. Mezz interactive restaurant entreats diners to embark on a culinary journey of European and Asian buffets. Meanwhile Saigon's award-winning French restaurant L'Olivier welcomes guests to savour gourmet Provencal cuisine and Michelin star promotions. Step into the Boudoir Lounge for a light lunch afternoon sweet treat or evening bouchee. By night the Boudoir becomes a more sultry bar to sip fine wines and sumptuous cocktails. A separate poolside bar serves refreshments amidst the Saigon skyline. Step into the Boudoir Lounge for a light lunch, afternoon sweet treat or evening bouchée. By night, the Boudoir becomes a more sultry bar to sip fine wines and sumptuous cocktails. The newly refurbished Ballroom and Function Rooms are set to represent a new benchmark of professional meetings in the city. Our InspiredMeetings team will always be on hand to ensure a Magnifique Experience. Our dedicated team implements modern meeting guidelines in a prestigious hotel venue. The luxuriously designed rooms, first-class cuisine and our Sofitel team of dedicated experts are a guarantee of success. Eight flexible meeting rooms comprise from 27 to 400 m² of function space featuring contemporary design natural light the latest conference technology and exquisite catering by Sofitels talented and creative chefs. Toast to your love with a sparkling glass of champagne. Dine on gourmet fantasies by Sofitel's talented chefs in menus tailored to your desires. Savour the sweetness of a traditional French piece montée wedding cake. 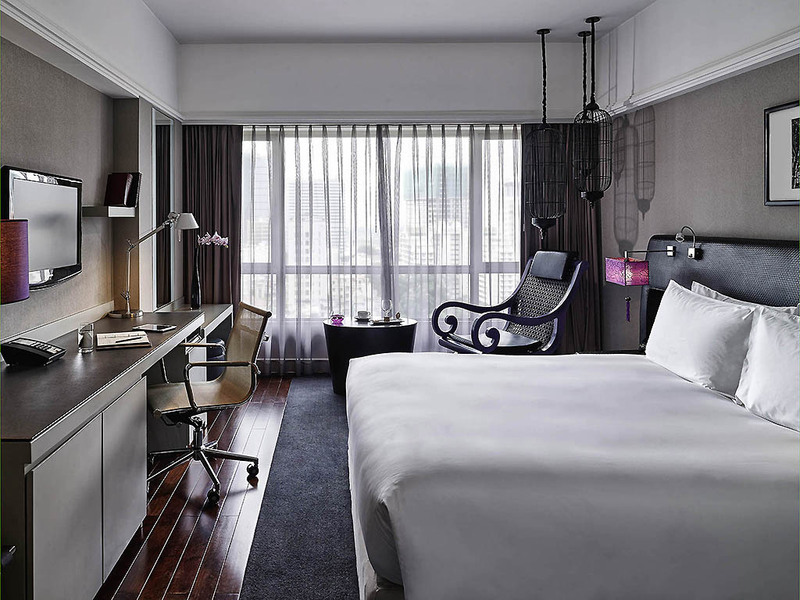 Sofitel Saigon Plaza features 286 luxurious rooms and suites, blending contemporary French design and Vietnamese influences, along with 5-star sensory indulgences. An elegant Prestige Suite is an ideal honeymoon retreat. Sofitel's InspiredWeddings Planner is dedicated to creating an unforgettable celebration for your special day. The Planner guides you in custom designing the details of your wedding to reflect your own personal love story and then brings it to life. The Diamond Hall, Sofitel Saigon Plaza's favoured wedding venue, sets the stage for a magnifique celebration with its elegant contemporary design and Sofitel's gracious service. Host up to 250 guests for a banquet-style reception. 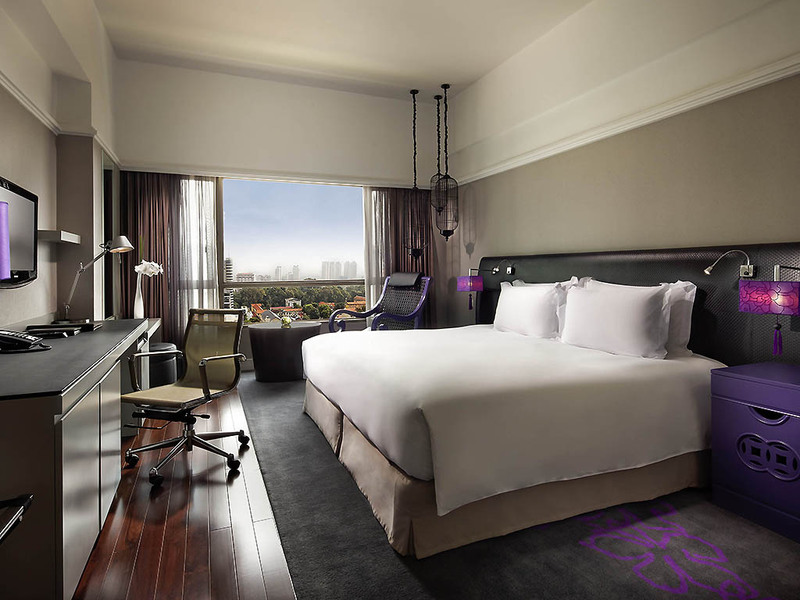 Sofitel Saigon Plaza is located on a quiet enclave of tree-lined Le Duan Boulevard in Ho Chi Minh City's District 1 steps from Notre Dame Cathedral. Your wedding guests enjoy a fabulous location moments from the city's best shopping, dining and landmarks. Treat your body to holistic therapies at The Natural Rendez-Vous Spa. The spa uses only 100% pure and active botanical ingredients soothing the body in a healing menu of Saigons best massage aromatherapy and skin rituals. 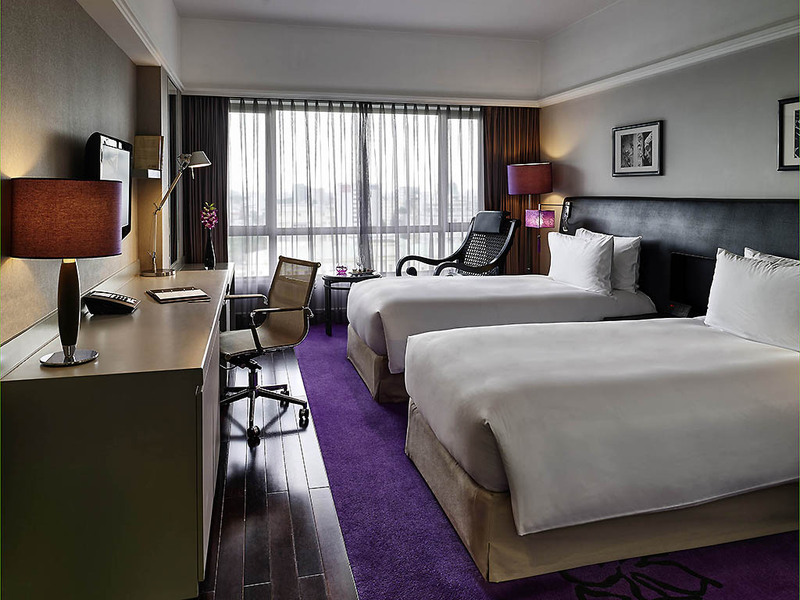 Guests staying at Sofitel Saigon Plaza enjoy a full range of 5-star hotel facilities and business hotel services. 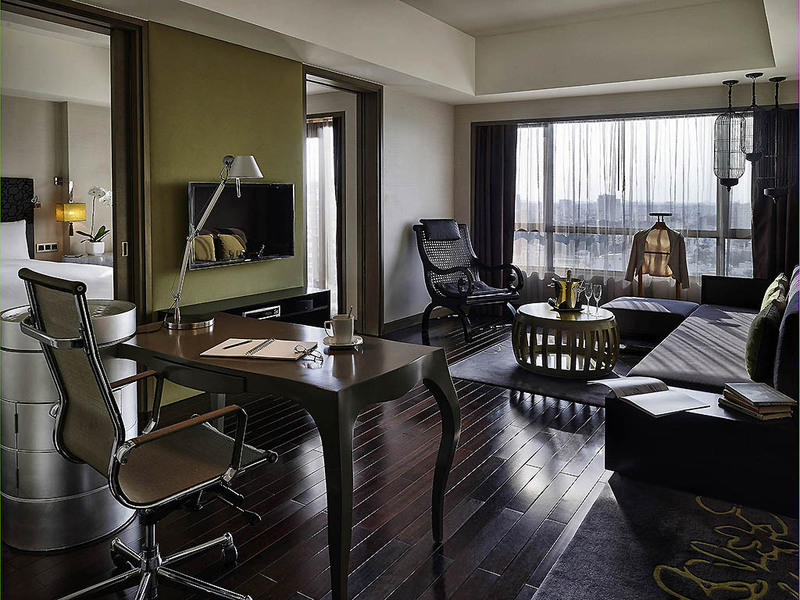 From the concierge desk to the business centre and babysitting all needs are catered to with Sofitels expertise. Saigon is great and we offer you the best artistic, cultural and gastronomic delights, from the pagoda with 10.000 Buddha's to the Old Post Office or embark on a culinary night tour on an 1950' Vespa tour as an exhilarating way to discover the city. Breathe in the fresh air and scent of the greens as you savour a round on one of Saigons outstanding golf courses. Sofitels concierge will be happy to make golf course recommendations and handle all of the arrangements. Invigorate with a work out at the Fitness Club. Strike a pose or find your rhythm in yoga and aerobics classes. Head to the rooftop swimming pool to go for a dip and soak in fabulous views of Saigons city centre.